If I were to recall my new year’s resolution for 2016, it would be this: “Do not sign up for any major race.” And by god, I’m doing it! I’m writing this now (and not waiting for January 1) because it’s been over a year since my last race: Chicago Marathon on 10.11.15. Running is fun again. Running pretty much stopped being fun. My body felt like poop when I ran and it was all about the time/pace or how running balanced out/burned off the food I was eating. I’m moving my body in ways that truly fill me up. Like hiking or walking Daisy. Instead of moving/exercising out of obligation. I feel way less pressure to fit in exercise. And what’s the point of exercising if it doesn’t totally light me up? More time!!!! I noticed in the past year how much I would prioritize training over a hang out. Or over taking time to sit down and read a book. Or write. Or focus on my business. Or take a long bath. Or nap. Or meditate. Or do NOTHING. It’s gotten easier. At first friends asked me to sign up for this half-marathon or that Ironman… the endurance athlete bug in me lit up at the thought of it. I even tempted myself with an ultra [still am tempted…] But when I kept coming back to my WHY and was the WHY strong enough to compel me to ditch my intention and sign up for a race… the answer always came back to no. And after several months, turning down races started to feel like a YES. It felt like a yes to honoring my body in a new way. There is absolutely nothing wrong with training for a race. In fact 95% of the races I’ve done have been some of the greatest days ever. 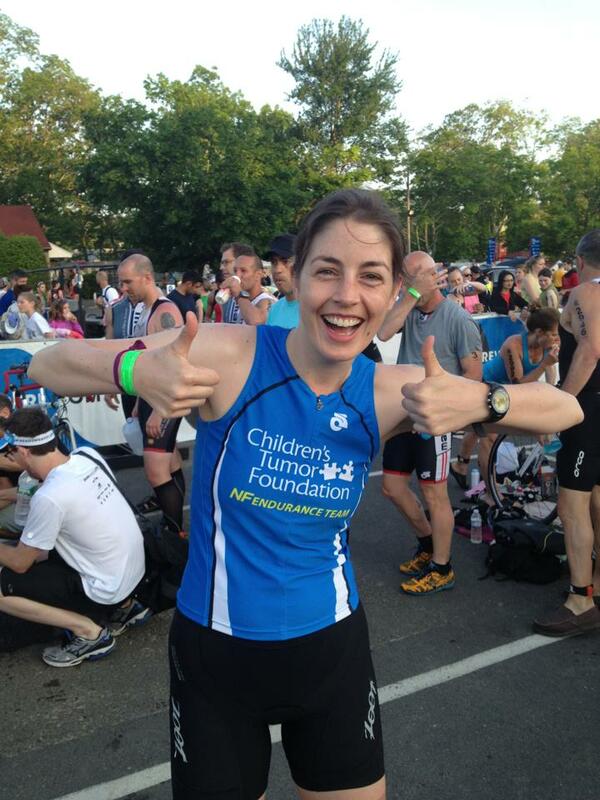 Like Ironman Lake Placid, my first year doing NYC Triathlon, and Chicago Marathon. Whew. Amazing days!!! But for me I know that I need to be careful. Or … mindful. Last year, I recognized I needed to create a new pattern and redefine my relationship to running and races. And so I took a year to pause and notice. Even as I write this, I notice that in the process of letting go of my attachment to being “an endurance athlete” I also let go of a few other attachments (things/beliefs/people/relationships) that just simply did not serve me. I’m still toying with the idea of one day jumping back on the endurance bandwagon [my heart is still set on an ultra-marathon] … but my approach is slower and much more intentional than ever before. 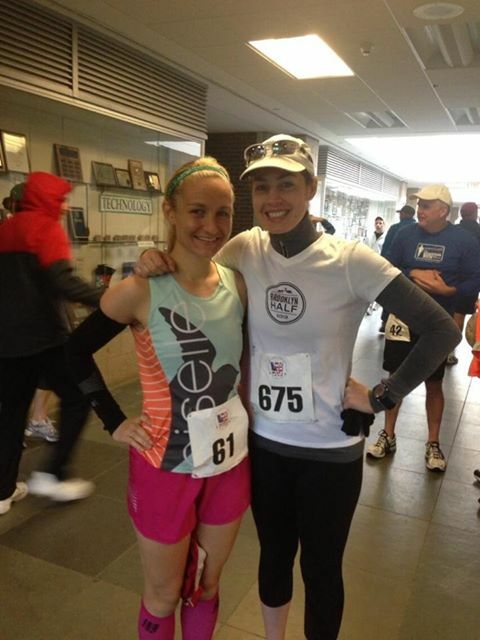 Why Do Endurance Athletes Need Health Coaching? 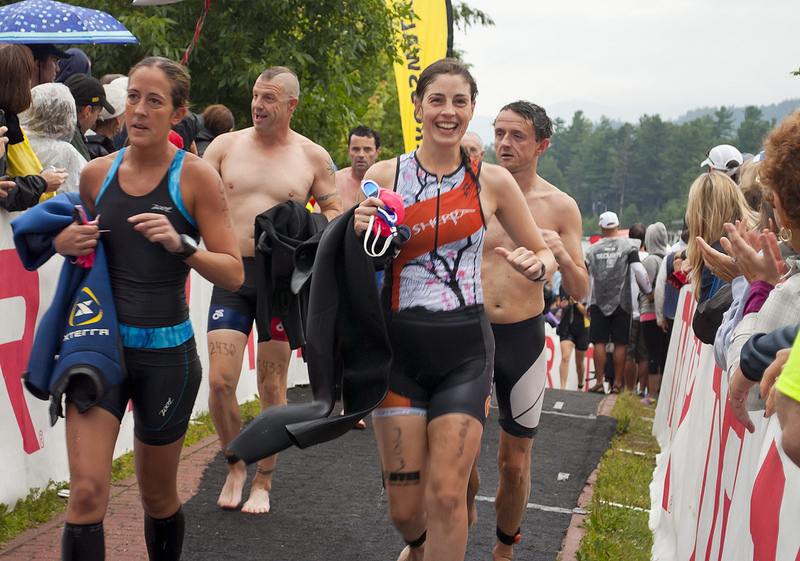 Ironman Lake Placid 2012 – just before the finish! I have been fortunate to coach some pretty incredible endurance athletes over the last few years. And we aren’t talking professional endurance athletes: we are talking the athlete who has a family, a career, hobbies, and somehow manages to integrate a training schedule with enough hours to constitute a part-time job. I love working with these people because of their intense drive and motivation – and also because I speak their language. I understand feeling like the “crazy” one who leaves a dinner party at 8:30PM because you have a 5AM training session. Don’t ignore the basics: food and hydration. Are you feeling drowsy every afternoon because of that 5AM brick workout, or because you are low on your water intake? Or could it be that skipping lunch because you are “too busy with work” is finally starting to catch up on your energy level during evening hill repeats? Proper hydration and nutrition seem simple enough but when we are juggling training for an endurance event PLUS everything life throws our way, we need to make sure we don’t ignore the basics. It’s training for your mind and soul. We spend so many hours every week fine tuning our body in preparation for race day. But what about preparing your mind? In coaching we confront all of the fears … the “what if’s?” of race day. One of my biggest fears around Ironman Lake Placid (and this is probably a popular one for many of you) was “What if I don’t finish?” I worked with MY coach and confronted this fear and came up with a mental game plan for how I might feel or react if I didn’t finish. And when I explored the what if’s instead of ignoring them, it felt like I got all my worrying out of the way. Like I had just “cleansed” myself of worries and had an (almost) worry-free race day! It makes race day that much more meaningful. One big reason I love coaching endurance athletes is that these folks have giant hearts and they aren’t afraid to dream big. They have an internal drive that pushes the envelope and is constantly curious what the human spirit is capable of. When you find tune your intention and reason for racing it’s like giving yourself an unlimited stash of mental GU gel. It’s a natural burst of energy that keeps you going through challenging training days and culminates in that final push on race day. Every race, every year, the reasons may change – they shift because we go through different obstacles in our lives. 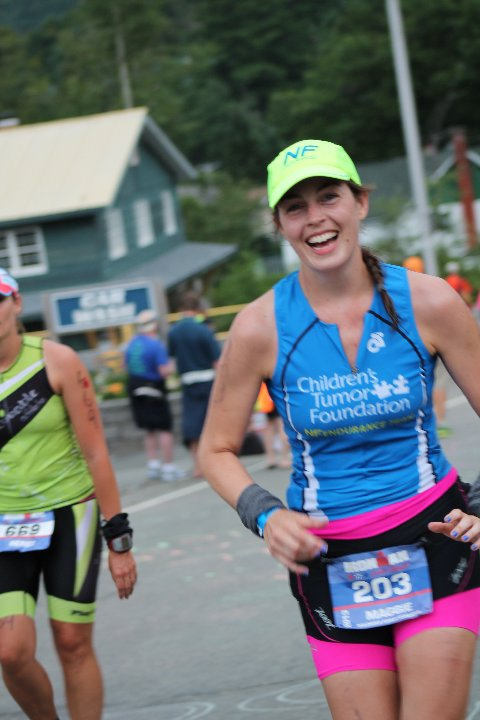 But when we cross the finish line, it’s so much more than just a PR or just a race – it’s a celebration. And that race can become one of the greatest learning experiences you’ll endure. If you are interested in health coaching in preparation for an endurance event, or have any questions about what coaching might be like for you, please don’t hesitate to email me at maggie@maggieconverse.com. Your first 30-minute session is on me! What is one thing in your life right now that you are afraid of? Is it the fear of losing someone you love? What about making a decision that would lead to a major life change? There is also the fear of not completing a task you poured your heart and soul into. We experience fear in pursuing our dreams, because we think we might fail. On top of that we experience (or at least I do) the fear of certain (mostly negative) emotions. We fear falling in love because we might get hurt; and also fear losing that person we love because we know damn well that it’s always going to hurt. Across the board, fear can be incredibly paralyzing. But I hope this post will give you some insight on how to move beyond fear. The other night I was out to dinner with some friends when the topic of Ironman came up. 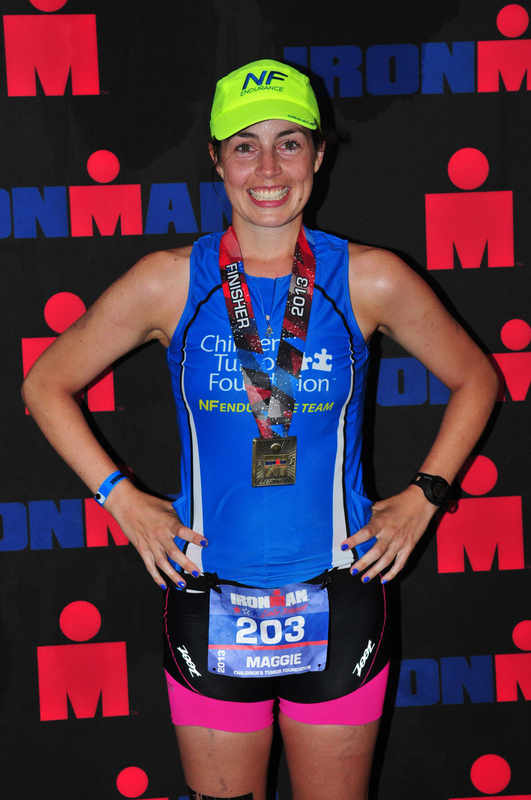 Beyond lots of hours of training, we were questioning what does it take to complete an Ironman? We concluded that it requires a great deal of mental agility and toughness and my friend Milly (runner and triathlete extraordinaire!) and I both discovered that we each wrote down lists of our greatest fears before race day. Especially in that final month. I was instructed to do this by my life coach and found it to be incredibly resourceful in learning to let go of some of the fear I was holding onto so tightly. Fear that then resulted in anxiety and unwanted stress. Once everything was down on paper though I was able to take on more of an “OK, so what?” attitude about my fear of failure. It didn’t seem so bad after all. I also discovered that my greatest fear pertaining to Ironman was far more than simply not finishing the event, failing, or not getting injured. No, my greatest fear was what will people think if I don’t finish… what will people think if I fail? And, who am I going to disappoint if I don’t finish? It took several discussions, lots of writing, and a solid amount of introspection to start to believe … So What? If I didn’t finish, I would be upset, but I knew that I would eventually get back on the horse and try again. If I disappointed people then perhaps they aren’t the people I want to hold close in my life. Most of you know that I DID finish Ironman but having written down that list of fears took a huge burden off my shoulders on race day. I recognized that I am human and I am far from perfect. I acknowledged the fact that if I did not finish Ironman, there was still so much for me to gain and to learn from the experience. I know that if I ever do sign up for another Ironman, these fears will cross my mind again. But I’m ready to confront them. So, what are you afraid of? We all have fear – especially when we are confronting something that is meaningful and important to us. Why not write it all down and go through each fear, one at a time – you will discover what is at the root of this fear and that maybe it’s not so terrifying after all. This could lead to new opportunity, a major life change, or experiencing your life’s journey a little bit deeper. If you’re still feeling stuck, send me an email at maggie.converse@gmail.com and we can set up a free coaching consult. 3AM on Sunday July 28 my alarm goes off. Ok, to be totally honest, I didn’t sleep at all the night before my Ironman. I tossed and turned, switched beds, meditated, went through a roller-coaster of emotions until that alarm went off and I could jump out of bed and get this momentous day started. I guess on the upside, not falling asleep meant not fighting with waking up at an ungodly hour. I took a shower, put on my Sherpa kit which I would wear for the swim, braided my hair, and started prepping my 1000+ calorie breakfast. I walked outside my room to find 3 gorgeous signs that my hero Clara and her family had made and affixed to my door, offering their final words of confidence. Team CTF arrived at transition to get body-marked, set up water bottles and nutrition on our bikes, and drop off our special needs bags. I found Brett and walked with him to the swim start where he helped me get into my wetsuit and then we said our final goodbye for the day which was far more emotional than I had anticipated. Suddenly tears welled up in my eyes, and I’m pretty sure I caught a glance of tears in Brett’s eyes too – but we can pretend this didn’t happen 🙂 I then managed to find my sister Grace, a great surprise, and said a final goodbye to her as well. It’s a funny thing these long course races. You say goodbye and you are on your own for the rest of the day, there’s no one there to hold your hand after a certain point. Coach Bob led the team in a final pep talk. I think we were all in awe that the day had finally arrived and we were standing there about to do this. Bob sent us off to find our places in the swim start. I found myself alone. Well, technically I wasn’t alone because I was one swimmer squished among thousands. But I kept scanning the crowd of wetsuit clad triathletes to find a familiar face. As if by some miracle out of the crowd I saw Reamonn, Laura, and Andrew all heading toward me. I don’t think they know how THRILLED I was to be able to stand with them as we awaited our turn to head into the water. I exited the swim, excitedly ran up to Bob to help strip my wetsuit and then off I ran to the bike transition. I grabbed my transition bag and headed to the changing tent where I was immediately greeted by a volunteer ready to help me get my swim clothes off, bike clothes on, and prepare for the bike. I wish I knew her name because she was so patient and helpful even getting my arm warmers on for me. I started putting items BACK in my transition bag and she insisted I just leave it, that she would take care of it. This was just a sampling of what was to come with the amazing volunteers all along the course that day. 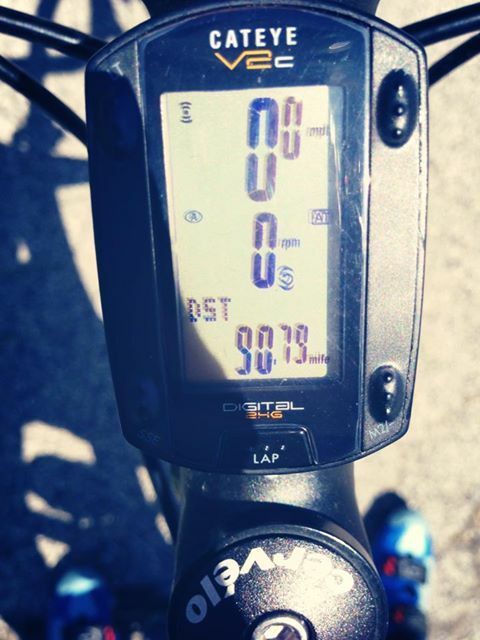 The bike was challenging but felt better than when I rode the course back at training camp in June. 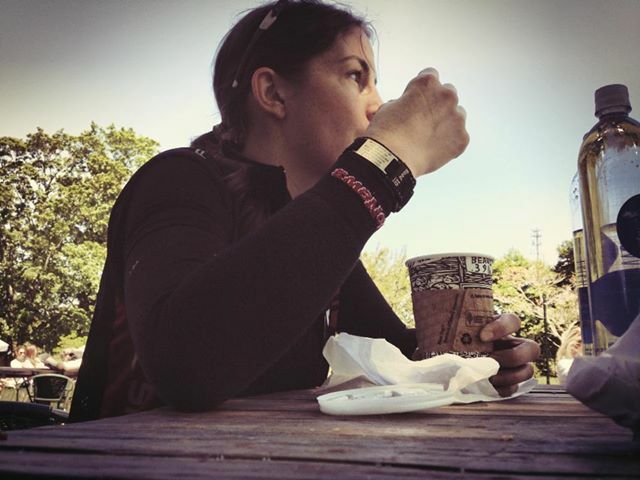 When I was out on the course (and not in town) I felt like I was on a long training ride and, the best part was that all my fears about mechanical issues just melted away. I told myself “you are going to do this, even if you get a flat, you are going to be ok, you are going to do this.” As the ride started to hurt at about mile 90, I tried a little experiment of focusing on gratitude. Instead of thinking about how many hills remained to climb or how my right quad felt like it was going to snap, I focused on how grateful I was to finally be experiencing this day that had been years in the making. 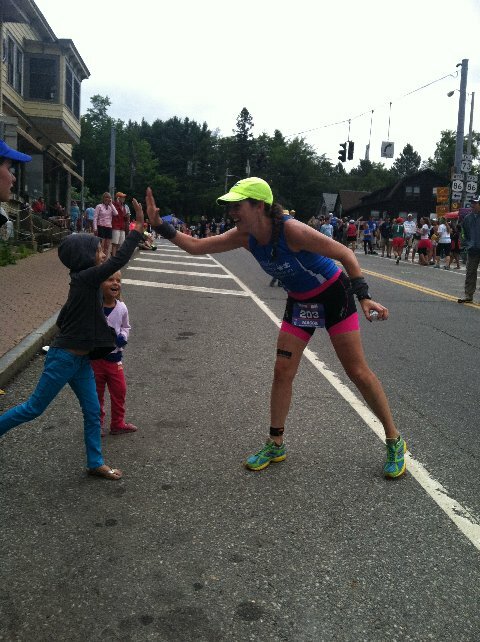 As I climbed back into town after the final lap, I saw my family cheering me on and I knew I was ready to run. Again with the helpful and ever patient volunteers helping me change in transition 2. I took my sweet time getting changed, figuring out exactly what I needed to bring, and then headed out to start my (first ever) marathon. As I exited transition, immediately people started cheering “Yeah Maggie! Go Maggie!” and I thought to myself “Wow, I guess a lot of these people must know who I am but I am having Ironman brain so I must not recognize them…” And then I realized my bib clearly says my name and it’s kind of a thing with Ironman that you cheer people on — it provides the utmost in support and motivation as you approach the end of a long day. I am barely half a mile in and I hear Meghan Newcomer, who raced Hawaii 70.3 for Children’s Tumor Foundation and is kind of a triathlon mentor for me as she’s got her pro card but also has a full time job. Oh and she’s also one of the nicest people I’ve ever met. Meghan yells out to me “Maggie! You look great! You look so strong!” And I was like “yeah man, I’m really doing this!” Well, I round the corner to the steep downhill (which would later be a steep uphill) and who do I see but CTF family (Sarah and Alissa) and my hero Clara and HER whole family including her two sisters Isabella and Nora. Clara’s mom was beyond excited to see me, in fact I believe she was jumping up and down and screaming my name at the top of her lungs. That provided a good laugh and I got to high-five Clara, giving me the boost I needed as I headed further out into the quiet that is most of the run course. You see, about 10 miles of each loop of the run course is an out and back referred to as River Road. Technically you’re not alone on River Road – you have volunteers and other runners and you make friends and talk to each other – but boy does it get QUIET. The first loop I remember being almost too easy, I had to remind myself to SLOW DOWN. As I made my way back into town and rounded the last corner before IGA hill (the super crazy ridiculously steep and long climb) I felt a rush of energy and powered up that hill. Dude, I don’t think I’ve ever run up a hill with such tenacity in my life. And of course, there was miss Clara and her family cheering me on again! I ran through town and literally felt like a rock star. It’s as if everyone I have made a connection with from when I signed up for my first triathlon in 2010 until now was out there either running or spectating and everyone was rooting for me. As I was making my way out of town again for my 2nd loop I ran into my teammate Laura who was about to FINISH her 2nd loop, about to become a 3rd time Ironman. It was pretty emotional knowing everything she has gone through in her life, living with NF, and also in this training season with a bad hip injury. I was so happy to see her just before she crossed the finish, looking strong as can be, and she left me with some serious words of encouragement that helped push me through MY 2nd loop. As expected, that 2nd loop was harder than the first. I had the occasional bout of nausea and started feeling an unfamiliar pain in my lower back, but I maintained a steady pace and focused on gratitude. Just before I started to head back into town with the cheering, music, and noise I took some time to reflect on what was happening. I only had a few miles to go and it finally dawned on me that I was going to be an Ironman. All the hard work had worked. All the support from family and friends along the way had worked and had helped me reach this point. I was about to accomplish one of my biggest dreams and I also was doing it with the knowledge that I was making a difference in a family’s life. I thought about the letter Clara’s mother had given me the day before, the letter that really hit home as to how much of an impact I had made on their lives. I had no idea and felt grateful for this gift, this new connection, that they had given to me. 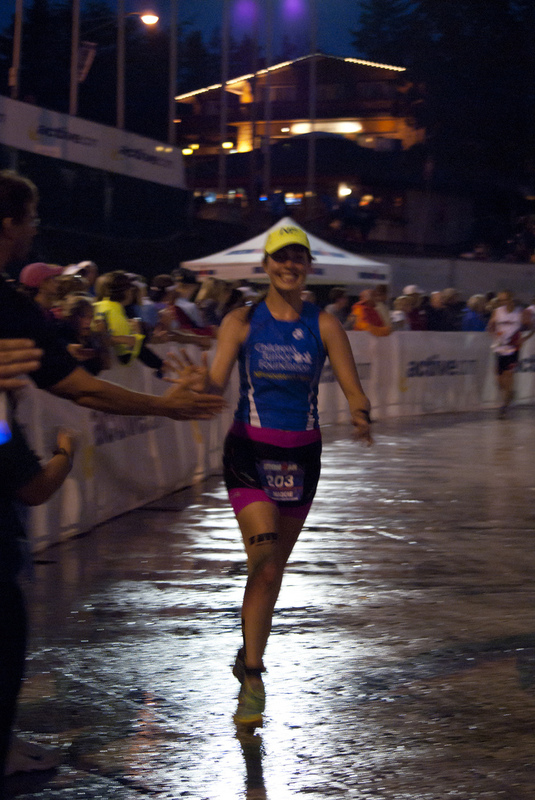 The finish chute and finish line of Ironman was more than I could have ever imagined. I got choked up even before entering the Olympic Oval. See, what happens is, the run spits you back into town and you can hear Mike Reilly calling people Ironman as they cross the finish, but you still have 2.2 miles left to run out and back. You finally start to approach the Olympic Oval and when you enter it people are lined up against both sides. You make that final turn and then BAM – bright white light, blaring music, people are screaming your name! I spotted my mom and dad, my sister Grace, I spotted Clara, I spotted Brett. They were all bunched together waving and screaming for me. I ran by them then quickly realized there was no need to rush now. I turned around and gave them all (ok almost all of them) hugs and kisses. I knew the day wouldn’t have been the same without all of them there. I then made my way to the bright light, to the finish line. 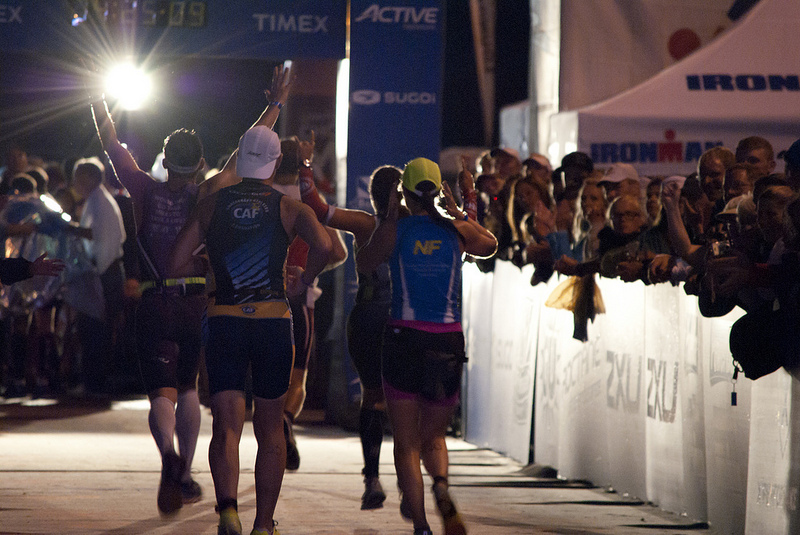 Before crossing I heard my name … I heard … YOU ARE AN IRONMAN. 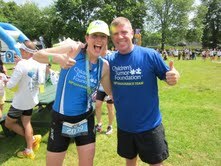 I crossed the finish, gave Dave a high five, and there was my coach Bob who placed my medal around my neck. What a perfect end to a perfect day. We hug, I cry even more. He asks if I am ok and I just say, over and over, yes and that I can’t believe it. I can’t believe I did it. And that my friends, is the story of my first Ironman. And if you’ve made it this far and read my whole race re-cap, well then you deserve a medal too. Or at the very least an ice cream cone or a quinoa cookie. Don’t you worry, there is still more to come from this journey, the lessons learned and the people that have come into my life. And the biggest secret of all: what’s next? I just realized that I can change my bio to read that I am officially an Ironman! Crazy lengthy race recap post coming soon. Just you wait! Where am I? Why am I here? Someone asked me what they should do about nerves for their upcoming first NYC Triathlon this weekend. Should they have a drink? Is there a magic pill they can take before the race? It made me think about what helps me when I get nervous before a race. It reminded me to listen to my own advice! This is really where the mental aspect of triathlon and all endurance sports comes into play. Yes a drink or a supplement can help calm us down but what it really comes down to is finding a place of calm within ourselves. Especially amongst the external noises and distractions. Whether it’s by taking 5-10 deep breaths, by reminding ourselves “I can do this”, or visualizing a positive race experience. You go through a kaleidoscope of emotions the days leading up to race day and of course the hours and minutes leading up to the start of the race. And I’m sure you are familiar with this already. The fear and the nerves are healthy and provide you with an extra burst of energy. But it’s also helpful to divert your mind away from the nerves. Imagine the crowds, the course, the feelings you will encounter along the way. It might feel like the hardest thing in the world at certain parts and at other times you will feel elated. 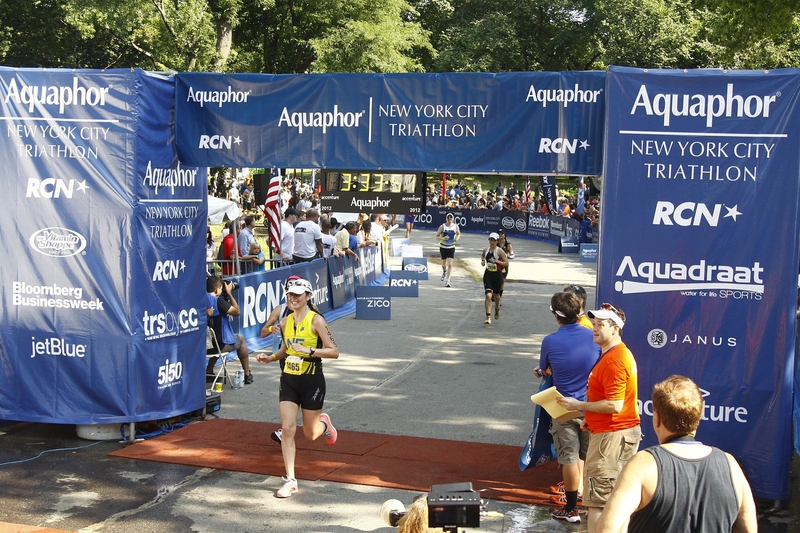 The first year I did NYC Tri was my first year doing triathlons and I was terrified of the swim. I had a moment of panic in the water but then got my mind on track thinking about “Where am I? Why am I here?” That year it was my uncle who passed away from cancer that brought me there. So think about your personal reasons. What inspires you? What motivates you to do this? This is your day. Your experience. And you are going to rock it. Thank you. All my teammates are inspirational to me. We lift each other up, people!! 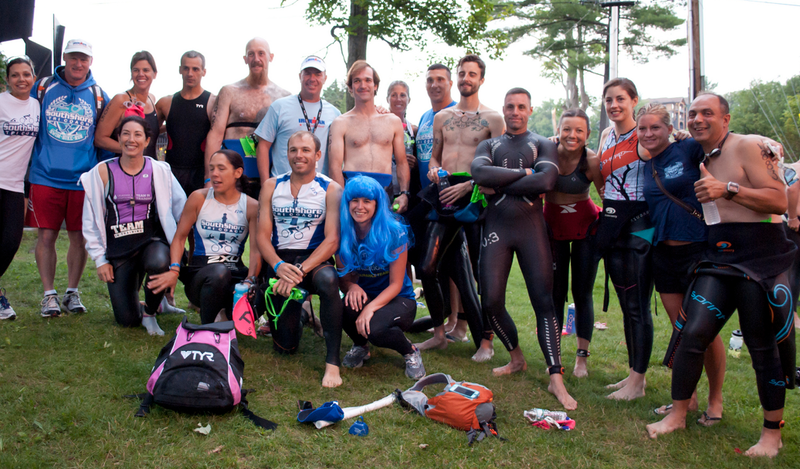 Sending all the best to my friends and teammates who will be racing NYC Triathlon this weekend.